Click on the links to visit the recommended websites or scroll down to find a pronunciation guide to the names in the book. Ten interesting facts about the Vikings. Watch a re-enactment of a Viking raid. Print out a pronunciation guide to the names in "Stories of Thor". 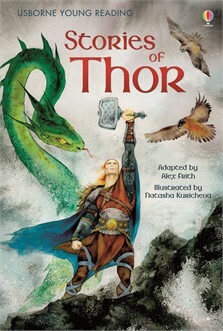 Three dramatically illustrated stories about Thor, the Norse god of thunder, specially written for readers who are growing in confidence. Thor never backs down from a fight, and can’t resist a challenge. Here he wrestles a huge sea serpent, faces a cave full of giants and has to fight a frost giant – without his magical hammer.